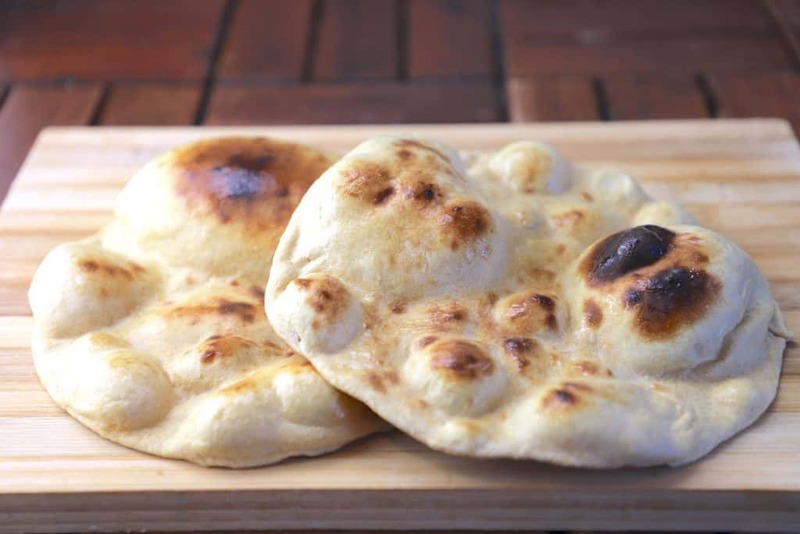 Tandoor bread is a type of leavened bread baked in tandoor. Tandoor is a clay oven, it is used to make lots of tandoori dishes like world famous tandoori chicken, naan, and lots of the other meat dishes. Tandoori roti is popular in Indian subcontinent, especially in the northern and some of the western regions. 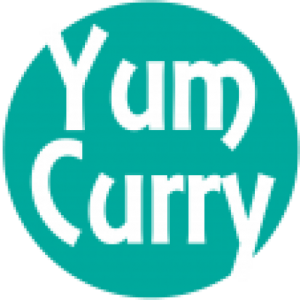 It is similar to naan bread, where naan bread is prepared plain as well as stuffed, tandoori roti generally prepared without stuffing. Traditionally it is prepared with wheat flour or combination of wheat flour and all purpose flour, dough is kneaded softly and fermented by yeast, and cooked in the clay oven. Cooking food in tandoori oven is quite old and popular technique to cook some of the best recipe, at present time it is difficult to make tandoor at home, especially in urban cities so we generally approach restaurants and hotel to have a bite of some amazing tandoori dishes. Word tandoori is so fascinating that there are lots of dishes are originating associated with tandoor, for example we were recently introduced by tandoori chai(tea) in India. Indians are fond of tea and in general they consume 3-4 cups a day. When these two popular thing tandoor and tea comes together and it becomes tandoori chai. This concept of making tea was exciting for chai lovers, especially its smokiness and flavour of clay in chai. I am lucky to be in Pune(Indian city) when this concept was introduced. We got taste of tandoori chai first time in Pune and it tastes amazing. It goes best with bun maska (bun with lots of butter). Now these kinda of chai shops are mushrooming around Pune and serving this unique concoction. People around Pune sniffed these shops around and now you will see they line up to get glimpse of its prep work which is utmost satisfying to watch and take a sip during casual hours. But it is difficult to access tandoor in urban cities since people cannot make them in their home. 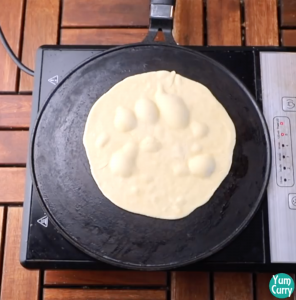 There are lot of ingenious techniques are developed to replicate the cooking process and the food without the use of the oven. Some of the alternatives are oven, grill and barbecue. These are fuelled by charcoal or wood to get that perfect smoky flavour in your food. 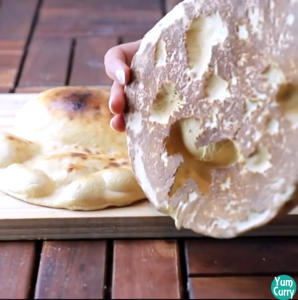 Whenever we crave for tandoori roti the only option is to approach restaurants, but now there are lots technique developed to make tandoori roti without using clay oven, you can make these roti’s at home, they are yeast free so it does not take much time to cook and you can make them by using simple ingredient from your kitchen. For making tandoor roti we need very few ingredient, add wheat flour and all purpose flour in a mixing bowl. Add salt, sugar baking soda and curd, mix all ingredient until mixture turn crumbly. 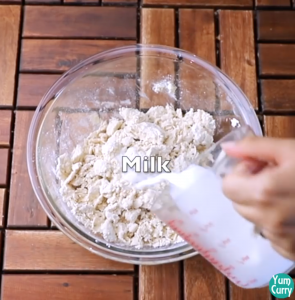 we are using milk to knead the dough so start adding little at a time, and knead a soft dough, kneading technique plays important role in roti texture, so here you have to do little extra work and knead it for at least 10-12 minutes for smooth and soft texture. When kneading is done. Apply some oil, cover the dough and let it rest for 10-15 minutes. This is also one the important step while preparing tandoori roti. 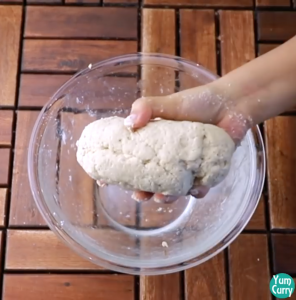 Divide the dough to the equal portion, we need bigger size of balls for making tandoori roti. 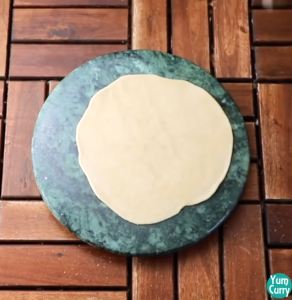 Roll the the dough ball in to a circle do not roll it very thin or thick (it should be thicker than our regular chapati rolled dough). Now its time to cook tandoori roti, the technique of cooking tandoori roti on tawa is different from regular roti’s. 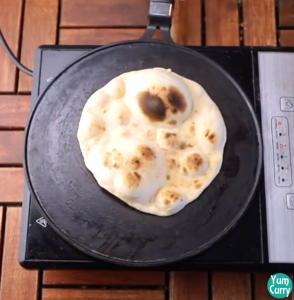 For cooking tandoori roti, apply generous amount of water to the surface of the rolled dough and gently place them on to the hot cast-iron tawa in a way that wet side the rolled dough should be on tawa’s surface, this will help to stick the bread on to the tawa and bread will not fall off, when we turn it upside down to cook roti on directly heat or stove flame. 1. To make it soft we are using milk for kneading dough and to get perfect and soft texture knead dough thoroughly for 8-10 minutes. 2. As we are not using yeast, so curd and milk will do their work and roti turns soft. 3. use cast iron griddle or tawa for cooking, do not use non stick. 4. 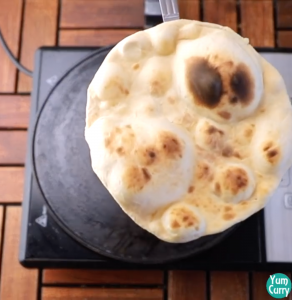 Apply water on one side in generous amount so roti can easily stick on the tawa and do not fall when you turn it upside down to cook directly on flame. 5. 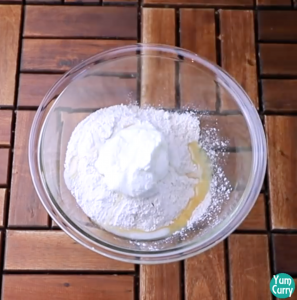 You can make it only by using wheat flour. 6. Serve them hot else they turns chewy. Tandoori bread served best with gravy dishes, like panner tikka masala, chicken tikka masala, malai kofta , paneer butter masala. 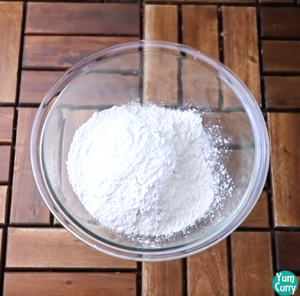 In a mixing bowl add wheat flour and all purpose flour. Add salt, sugar, baking soda, oil and curd. Mix all ingredient well until it turn to flaky mixture, start adding little milk at a time to knead a soft dough. (we are using milk to knead the dough). 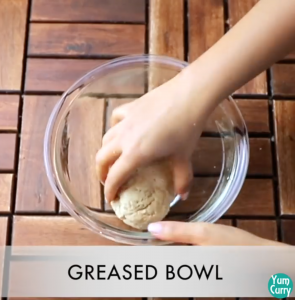 Transfer kneaded dough to the greased bowl and apply some oil on the dough. 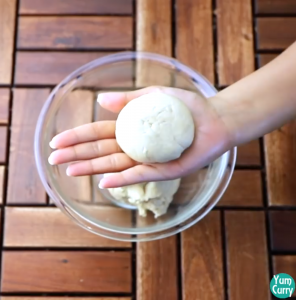 Knead it again, take a portion from the dough, roll between your palm and gently flatten it. 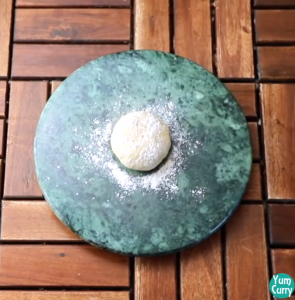 Place dough ball on to the rolling board and dust with some flour. 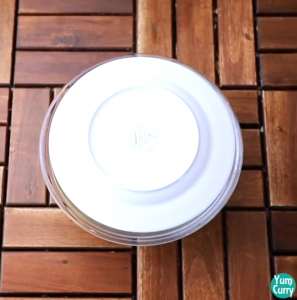 Start rolling dough evenly and thin to a 6-7 inch diameter circle. 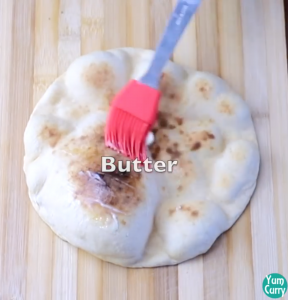 By using brush spread water evenly all over the roti surface. 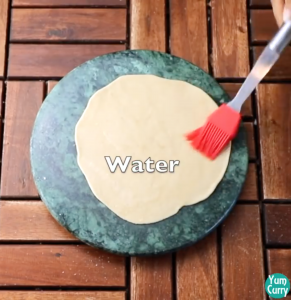 Place rolled dough on to the hot tawa, keep water side down. you will start seeing bubble. Because of water applied on rolled dough, dough will stick to the tawa , turn the tawa up side down and cook roti directly on induction heat. (use cast iron tawa for cooking roti, in non stick dough won't stick and it will fall off from tawa when you turn upside to cook roti). Rotate and move it for evenly cooking, brown spots will start appearing on bread. Gently pick it up by using spatula, and take out from tawa. Apply some butter, tandoori butter roti is ready. 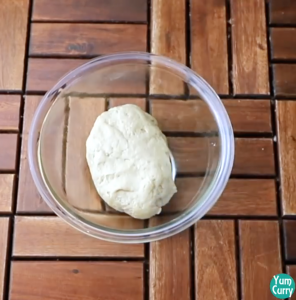 Place dough ball on to the rolling board and dust some flour. By using brush spread water evenly all over the surface. 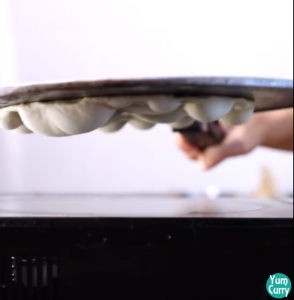 Because of water applied on rolled dough, dough will be stick to the tawa , turn the tawa up side down and cook roti directly on induction heat. (use cast iron tawa for cooking roti, in non stick dough won’t stick and it will fall off from tawa when you turn upside to cook roti).